A couple of evenings ago, Raven was giving her alarmed something-strange bark, rather than her usual I’m-bored play bark, out at the front of the house. Usually when she does this there is actually something worth investigating (even though we don’t always find it), such as a turtle. That evening when I stepped outside, I could hear chittering coming from the rafters of the roof overhang above the front porch. 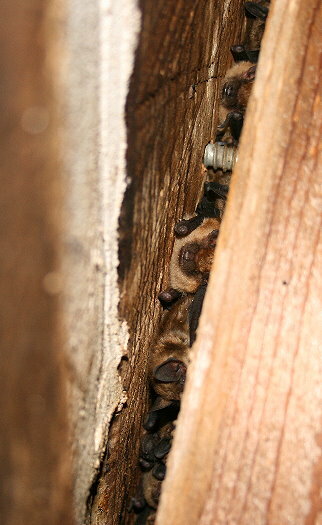 Closer investigation revealed a small group of bats tucked up between the thick support beams and the side of the house. I believe they’re Little Brown Bats, Myotis lucifugus. Little Browns are a very common species through Ontario as elsewhere, and are the most widespread and common of Canada’s species. They are often found roosting in attics or chimneys of houses, something that most other species don’t do, or do infrequently. Little Browns will give birth and raise their young in communal maternity roosts, which they will use year after year, often returning to the same one where they were born. My parents’ old house had one such roost in their attic, I think. Other night-time roosts may not be used as regularly, and indeed I think our Little Browns only stayed a couple of nights (perhaps they were put off by the flash of my camera). When I stepped out to see what Raven was barking about, I found this mess all over the front stoop. 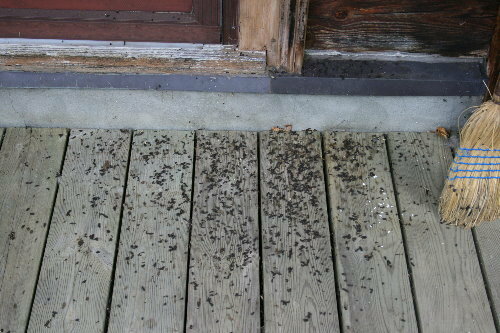 Bat droppings, they looked a little like mouse droppings only larger, and were concentrated directly below the roost. Although I don’t think it was likely to do any good here, bat guano can be a very useful thing. In some areas, it’s collected from caves and used as a high-quality fertilizer. The bacteria harboured within it can also be used for detoxifying waste, improving detergents, and creating antibiotics. 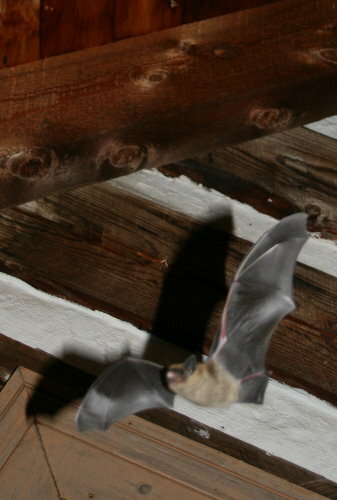 Bats are the only mammals that can truly fly; other mammals may glide but are incapable of sustained flight. Their wings are thin membranes stretched across long bones that are modified hand bones. They catch their food, flying insects such as moths, beetles and mosquitoes, in flight. Small insects are snagged in their mouth, but larger ones may be caught in a pouch they form by curling forward. their back legs and tail, which also have membrane stretched between them to act as a rudder in the same manner as a bird’s tail. 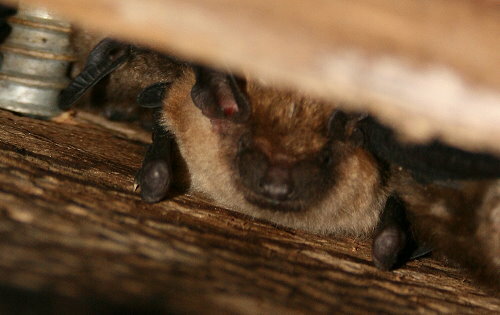 The scientific name Myotis means “mouse ear”, and indeed their faces do have a mousey look. I really like bats, and since they’re big consumers of mosquitoes, am happy to have them roosting at our house. I hope I didn’t scare them away for long. There’s a bat box above the door, perhaps they’ll return to use it. Wow, your pictures are great — and so is the tale! Congrats on your new neighbors! I absolutely delight in bats, alive, anyway. Having been at a wind farm for 2.5 years, any live bat makes my heart race and I kind of want to freeze the moment of immortality. Anyway, thanks for keeping the food chain/web represented! Very cool! Raven’s quite the discoverer. I hope your new friends come back and stay a while. after capturing and removing my third such animal from my house since 11:30 last night (it is now 6:15 am), I am not so delighted. I do love my dogs more than ever however, it was their different bark that alerted me to their presence – INSIDE! Thank you for this article. I was convinced we were all going to be bitten and turned into vampires! on your Blog, you can also make money Blogging by placing Google Adsense into your Blog.